Wendy brings decades of teaching experience to her studio in Ann Arbor, Michigan, where she is a faculty member of the Ann Arbor Suzuki Institute, and works with students of all ages on violin and viola. She is devoted to the Suzuki philosophy, that through the study of music, all children have the ability to learn to play, develop the mind and heart, and become more enriched and fulfilled—- children of any age! Wendy provides opportunities for her students to learn and grow, with ample recital, master class, contest and audition preparation opportunities. Her students enjoy sharing their music with other children, families, and the wider community. She completed Suzuki violin unit training and supplemental coursework with Ronda Cole, Ann Smelser Montzka, Nancy Jackson, Linda Case, and Cathryn Lee, and teacher enrichment courses with master pedagogue Simon Fischer. Students in Wendy’s studio experience music as a gift for life; skills and knowledge which they discover their potentials, and are enabled to continue developing and deepening as they explore and enjoy their music. It brings great satisfaction to learn to focus and maintain discipline, solve problems, gain mastery of skills, prioritize tasks and challenges, set goals and take steps towards their completion, develop one’s talents and character to the fullest one can, and share the positive joy of music with others. Ms. Zohar teaches the whole child, based on Suzuki principles of education. Wendy approaches each child’s learning patterns and needs in a unique way. To help each child she draws from traditional as well as innovative elements of instruction, absorbed and synthesized over a lifetime of violin and viola performance, study, and teaching. Wendy enjoys seeing her students progress, and she counts them among the sources of her greatest inspiration. Many of her pedagogic insights, innovative concepts and skill games arise during lessons, while she is problem solving together with her students. She has developed these insights into enjoyable presentations, and shares her unique pedagogic ideas with teachers and students around the US, where she gives clinics and workshops on movement, balance, posture, set up, tone, memory, and improvisation. 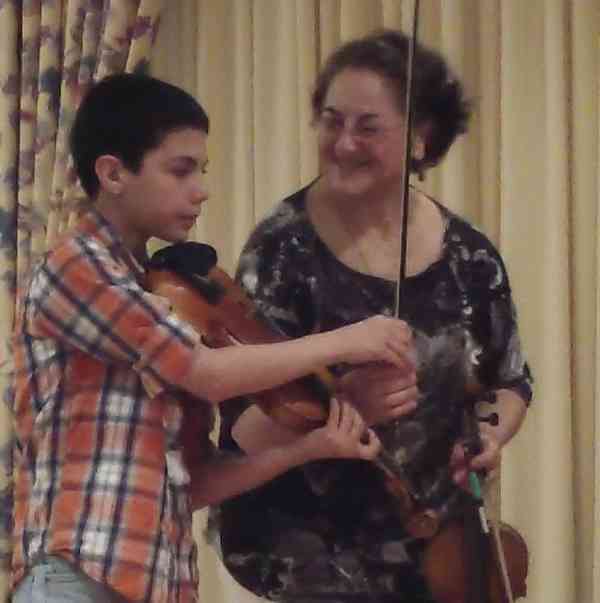 Ms. Caron Zohar began her violin studies at age 9 in Cleveland. She performed the Mendelssohn Violin Concerto with her high school orchestra. She won full scholarships to pre-Professional and Professional summer programs including Eastern Music Festival (1), The [Castleman] Quartet Program, Congress of Strings (sponsored by the American Federation of Musicians) (2), and the Colorado Philharmonic (3) (see notes below). She was awarded a 4-year full merit scholarship to the College-Conservatory of Music, Univ. of Cincinnati, where she completed a Bachelors Degree in Violin Performance and was a winner in the Emil Hermann Concerto Competition. This was followed by a full scholarship and String Quartet Fellowship with stipend to the School of Music, Univ. of Wisconsin, Madison, for a Masters Degree in Violin Performance with emphasis in chamber music, violin pedagogy and music history. Upon auditioning she was invited to join the Jerusalem Symphony Orchestra, and a decade later was invited to a position in the Primavera Chamber Orchestra, London, UK. Since that time she has played in many other orchestras and chamber ensembles, and has played in solo recitals around the world. Her key teachers of violin include Jeannette Drinkall Meyer, Henry Meyer of the LaSalle Quartet, Thomas Moore, Ramy Shevelov, Simon Kuhn, Chaim Taub and Max Hobart. Viola teachers include Heidi Castleman, Paul Doktor and Garfield Jackson. She has participated in Karen Tuttle Viola Coordination Workshops where she was enriched by the teaching and artistry of Kim Kashkashian, Karen Ritscher, Jeffrey Irvine, Carol Rodland, Susan Dubois, and others. She has been enriched by individual coaching and special study, both on violin and viola, and in chamber music and master class settings, with artists including Lynn Harrell, Joseph Gingold, Janos Starker, Nobuko Imai, Simon Kuhn, the Tokyo Quartet, Norbert Brainin and Martin Lovett of the Amadeus Quartet, ‘Manny’ Emmanuel Horowitz, and members of the Endellion and Borodin Quartets. Ms. Zohar earned an advanced diploma in the Kodály Approach to Music at the British Kodály Academy, London, UK, and the Franz Liszt Academy of Budapest, where she studied Kodály preschool and classroom pedagogy, and instrumental and vocal conducting with Cecilia Vajda, and music theory, ear training and advanced Kodály pedagogy with Professor Erzsebet Szönyi. Wendy’s Kodály training comprised early childhood development as well as progressive, advanced musical training through high level proficiency. Her Kodály studies include music development for very young children, singing and choral music for all ages, instrumental and choral conducting, movement and dance, music theory, harmony, advanced solfege, ear training, and composition. Ms. Zohar has participated in continuing Kodály training programs with Profs. Katalin Forrai, John Feierabend, and other Kodály specialists. Additionally, she has training and experience in Jacques Dalcroze Eurythmics, Orff Methodology, the Paul Rolland Action approach, the Alexander Technique, and Feldenkrais Awareness Through Movement, all of which she utilizes in her pedagogy. As a student of Baroque and informed “Period Performance” practice on violin and viola, Ms. Caron Zohar counts among her most valuable teachers and coaches the devoted faculty of the Baroque Performance Institute in Oberlin Ohio, including violinists Marilyn McDonald, Marc Destrube, Emlyn Ngai, Cynthia Roberts, Julie Andrijeski, violist Jane Starkman, and baroque cellist and bowed continuo player Catherina Meintz and bassist and conductor Ken Slowick. In addition she values her work on baroque violin during the Summer Tafelmusik Institute with Jeanne Lamon, conducting studies with Ivars Taurins, and coaching work with other members of the Tafelmusik ensemble. As a long time member of the Jerusalem Symphony Orchestra Ms. Zohar participated in a decade of subscription seasons, extensive European tours, performing concerts across Scandinavia, Germany, Switzerland, France, and the U.K., and recordings for broadcasts on Voice of Israel radio station. She also recorded solo recital programs for violin with piano, which were prepared for scheduled broadcast on the Voice of Israel classical radio station. She was also a frequent chamber player on the stages of Jerusalem and London. As a member of London’s Primavera Chamber Orchestra she played concert series across the UK and throughout France, and made recordings with them. In the US, she has performed with the Cleveland Chamber Symphony, the Ohio Chamber Orchestra, the Orchestras of the Ohio Ballet and Opera, the Ann Arbor Symphony, Saginaw Bay Symphony and Adrian Symphony. She performs as a free lance musician across northern Ohio and southern Michigan. Ms. Caron Zohar is a composer of music for theatre and film. In London she performed her musical score for solo viola, composed for a live theatrical adaptation of Death in Venice, written and directed by former husband, the artist Israel Zohar. Ms. Zohar’s performance of her solo viola score, with extended dramatic techniques, was received warmly by audiences and reviewed to acclaim by London’s Time Out magazine. Wendy worked in a collaboration with a film maker in London in composing and recording an original film score for violin, viola and clarinet, and with a film maker in Cleveland, where she wrote, performed and recorded a film score using soprano recorder, drums and viola. For many years she managed the artist portfolio and was artist representative for her former husband, [artist and theater director] Israel Zohar, and helped land him significant art shows and contracts with galleries with career altering success. Due to these connections he became an official portraitist of Princess Diana, and presented the portrait to Princess Diana and Prince Charles. Ms. Zohar has three grown sons, all of whom share her zeal and aptitude for music, art, writing, and elevating the human experience, and have incorporated these among their professional pursuits. In her ’spare time,’ while raising her children, she acquired a law degree, became a member of the Ohio bar and developed a law practice which included art and entertainment law, immigration, family, consumer protection and employment discrimination law. She later returned to music full time and is currently pursuing her passions which include developing the minds and hearts of children, and providing youthfulness training for aging adults. Wendy is fascinated by the connection between developing abilities in music and the nurturing of neural plasticity, character and intellect. She has discovered an ability to help students in physical healing after injury or the effects of aging, through insightful, gentle motion exercises. Wendy has long felt rooted in music’s role in the story of human evolution, and how music is central to human expression, individualism, contentedness, spiritual refinement, intellectual development and attainments, and maintaining good brain and mental health even into old age. She would like to find ways to make quality music instruction accessible to all children, so that more people can experience from an early age the possibility of greater happiness and self fulfillment through music, over their lifetime. During Col. Phil. summer season performed (sang) solo soprano part in Nielsen’s 4th Symphony, as she played from her seat in the violin section.